I’m on my way over. I’ll be there in an hour. I’ll be looking forward to some freshly-made lemonade when I get there!!! Those look gorgeous! I love lemons! No way, your yard?!? Those look marvelous! Oh, I am so jealous! 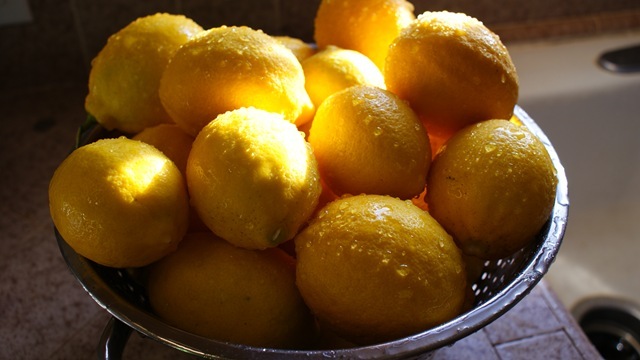 What I wouldn’t do to have beautiful lemons like that come out of MY backyard. Oh yes – are you in CA, too? We’re busting with citrus around here right now. Fresh squeezed juice for all! Yum! I once had a relative rip out a lemon tree because they thought they wouldn’t use them! I couldn’t believe! I’m a major lemon-lover! Being in the COLDER region of our nation, I’m very jealous. I can’t even imagine how much tastier lemons off your own tree must be! SUPER jealous! Those looks delish. What are you making with them? I have a black thumb so I am super jealous you grew them. De those are beautiful. I would love to make some lemon chicken and capers with those, how fresh and wonderful would that be? That’s so awesome! We got a good harvest this year, too (but in Nov-Dec), but I didn’t get a good photo. You sure did! We froze the juice this time, in ice cube trays, so I won’t have to buy lemons all year. What’d you do? Love the lemon. The lemony wins over chocolately every time! Lemons from the backyard! Oh My! I would LOVE!! Oh God, those are beautiful! Oh my gosh, those are fantastic! I want a lemon tree now.